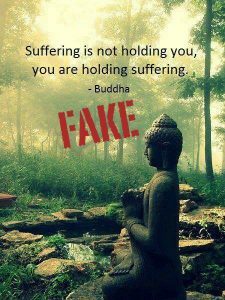 Suffering is not holding you. You are holding suffering. When you become good at the art of letting sufferings go, then you’ll come to realize how unnecessary it was for you to drag those burdens around with you. You’ll see that no one else other than you was responsible. The truth is that existence wants your life to become a festival, because when you are unhappy, you also throw unhappiness all around. I say to you that suffering is not holding onto you, you are holding onto suffering. And if you can agree to look into what I am saying, you will come to understand it for yourself. Not only will you come to understand it, but you will experience a letting go – and you will come to know how suffering can be dropped. And when you become good at the art of letting go of suffering, then one day you will realize that you were dragging it around with you – and no one except you was responsible for this. Whatever suffering you experienced, nobody else was to blame. It was your wish, you wanted to suffer. Now this, monks, is the Noble Truth of dukkha (suffering): Birth is dukkha, aging is dukkha, death is dukkha; sorrow, lamentation, pain, grief, & despair are dukkha; association with the unbeloved is dukkha; separation from the loved is dukkha; not getting what is wanted is dukkha. In short, the five clinging-aggregates are dukkha. Fake quotes can definitely be more poetic and inspiring than the genuine article, which is why they’re in such wide circulation. My only concern is to encourage people not to falsely attribute things to the Buddha. In this case the correct attribution is (probably) Osho. I suppose you’re right on a technical matter – but this is the exposition of the thought. After all, this is the exposition on the “cessation of suffering,” right? Ultimately it is you/me who suffers… not a self-existent suffering world forcing itself upon you (or me.) If suffering exists “out there” (outside us) then the answer is to deal with it “out there,” and that’s how 99% of humanity relate to suffering… as something to stop by social justice, political modification, money, power, new cravings, etc. Such an approach never works. But, since suffering afflicts us at a mental level, it is “us” that proverbially hold it. While the words in this order were not said by the Buddha, it’s theme is Buddhist. Which you stamp with a big red “FAKE” like the Snopes version of Buddhism. I’m not sure what you gain here. If you were fighting people changing the meaning or intent of Buddhism, I would understand… but you’re going after expositions of intent and marking them fake if they aren’t exact quotes. How does this help, if the theme of the comment is a simplified theme within Buddhist doctrine? I would have thought the concept of a “quote” was quite simple. A quote is something that someone actually said or wrote (or that we’re reliably told they said or wrote). Something that is nothing more than someone’s interpretation of his teachings is not a quote. Since someone else wrote the words, the quote, not matter how “Buddhist” it may be, is misattributed.